In spite of its gritty industrial location near the Oakland International Airport, Lighthouse Community Charter School is one of the most in-demand schools in Oakland. The high walls and black security fences keep unwanted visitors out, but the popularity of the school makes it hard for prospective students to get in, too. Last year there were 700 applicants for just 60 open seats. The school holds a lottery to see who attends. And for good reason. Ninety five percent of the school’s graduates leave ready for college—90 percent of whom are the first members of their family to go college. That may come as a surprise in a school where 85 percent of students are low-income and 50 percent come from families living below the poverty line. Starting next year Lighthouse will soon have another distinction: this fall it will become one of the the first public schools in the U.S. to make making part of a campus-wide curriculum. The K-12 school received a $250,000, two-year state grant to expand school-wide what is now just a robotics/design class for juniors and seniors. As part of the grant, the school will also create a series of best practices to help other schools incorporate making into their curricula if they so choose. 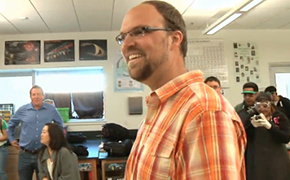 Physics teacher and resident maker Aaron Vanderwerff spearheaded the school’s making program and will oversee the grant, offering his expertise to help teachers develop lessons plans and training where necessary. He’s seen the impact making has had on his students. Students at Oakland’s Lighthouse Community Charter School colloborate on a project for their robotics class. “The act of making is a different kind of learning,” says Aaron, one where the “lesson” isn’t clear until the end of the process. Vanderwerff, known to students as Mr. V, started at Lighthouse as a psychics teacher in 2009 but he brought a strong maker sensibility with him having attended several Bay Area Maker Faires. In fact, several of his students showed off their projects at Maker Faire Bay Area in May and got a lesson in creative problem solving. A group of students had been building an electric go kart. But in spite of the campus security someone stole it. So they came up with a plan B. They had received an electric scooter and made it into a solar-charged vehicle in time for Maker Faire. In addition to physics classes, he began teaching a robotics class that might have be better called Making 101 since it took in disciplines like sewing, woodworking, engineering, design, 3D printing, electronics, and more. he seems tailor-made for the job. Aaron represents the ideal type of teacher we hope that all students can have, the teacher whom we envision facilitating learning in classrooms of the future — classrooms full of kids who are learning by making. He trusts his students, letting them and himself take risks and and embrace the opportunity, and sometimes terrifying uncertainty — to independently work towards the completion of ambitious projects. He asks his students to take the same analytical, inquiry-based approach to both their science projects and their Maker Faire exhibits. Students choose the problem they want to solve, figure out their own procedures, build their own tools, complete their projects, and analyze and present their results. In effect, he asks them to work as scientists and engineers do. Aaron knows when to sit back and observe, as well as when to step forward and help. He’s willing to ask more questions than he answers, challenging his students to think critically, collaborate, and learn alongside one another. Through making with his students, his students internalize the processes of design, science, and engineering. This isn’t easy to do. But Aaron patiently works with his students to do it, because regardless of what path they follow after they leave Lighthouse, these understandings will yield an impact in their lives far greater than merely mastering the simple facts of science. When he came to Lighthouse one of his first projects involved getting students to build aRube Goldberg-like mousetrap. But he soon learned many students lacked basic woodshop skills to complete the project so he brought in various power tools to get his students up to speed. And they did. “It made me very happy to see ladies with very long nails use a baby Skil Saw,” he said. Of course making isn’t new. Shop, jewelry, and auto mechanics classes were once common in public schools but support for those hands-on courses waned as the push for a test-driven, standards-based education gained prominence. Stauffer calls making a “new-old concept” and represents what she sees a swing of the pendulum away from rote testing and the teaching of standards as a way to bridge the so-called achievement gap between socio-economic groups toward a more practical education based on experiential learning, accessibility, design, and “failing forward” where mistakes are to be expected and welcomed as part of the learning process. She’s particularly excited about the possibility the grant offers in facilitating greater parental involvement. Many of the school’s parents work in trades and some have not found as way to become involved in the school and share their knowledge, something that the school asks of parents. Incorporating making in its many forms can give parents that opportunity, Stauffer said. “If we can get that I’ll be really excited,” she said. On the last day of school, students were writing thank you letter to mentors who had come into the class to help them. Mentors are a big part of Vanderwerff’s success. He’s able to bring in professionals from Pixar and Silicon Valley to speak and work with students. And even as the stood on edge of summer graduation and graduation, seemed to get that they’ve been part of something specials. Lighthouse students Carlos Ramirez, Raul Pena, and Tony Ramirez and their EV truck project. “This class made me feel good and that I did something positive,” said senior Carlos Ramirez. He was one of three students who built an electric vehicle conversion project. Now he’s interested in pursuing a career in automobile design, a career path shaped in part by his maker education and Vanderwerff, he says. That’s just the kind of experience Vanderwerff and Stauffer want to hear more of making goes school-wide next fall. “Science, at it’s root, is trying to understand the world around us,” said Vanderwerff. Letting students become active participants in their own education “lets the kids know they’ve been respected,” he said.